This article is about the market town in England. For the town in Australia, see Horsham, Victoria. For other uses, see Horsham (disambiguation). Horsham /ˈhɔːrʃəm/ is a market town on the upper reaches of the River Arun on the fringe of the Weald in West Sussex, England. 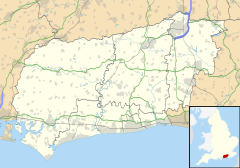 The town is 31 miles (50 km) south south-west of London, 18.5 miles (30 km) north-west of Brighton and 26 miles (42 km) north-east of the county town of Chichester. Nearby towns include Crawley to the north-east and Haywards Heath and Burgess Hill to the south-east. It is the administrative centre of the Horsham district. The first historical record of Horsham is from AD 947. The name may mean either "horse home" or "Horsa's home" (a Saxon warrior who was granted land in the area). The town has historically been known for horse trading in early medieval times, iron and brick making up until the 20th century, and brewing more recently. Horsham is the largest town in the Horsham District Council area. The second, higher, tier of local government is West Sussex County Council, based in Chichester. It was once part of the county of Surrey in 1758 until a change in boundaries through the parliament act in 1867. In addition there are various Parish Councils. The town is the centre of the parliamentary constituency of Horsham, recreated in 1983. Jeremy Quin has served as Member of Parliament for Horsham since 2015, succeeding Francis Maude, who held the seat since 1997 but retired at the 2015 general election. Horsham holds the UK record for the heaviest hailstone ever to fall. On 5 September 1958, a hailstone weighing 140g (4.9 oz) landed in the town. It was similar in size to a tennis ball and impact speeds have been calculated to be 100 m/s (224 mph). Horsham is 50 metres (160 ft) above sea level. It is in the centre of the Weald in the Low Weald, at the western edge of the High Weald, with the Surrey Hills of the North Downs to the north and the Sussex Downs of the South Downs to the south. The River Arun rising from ghylls in the St Leonard's Forest area, to the east of Horsham, cuts through the south of the town then makes its way through Broadbridge Heath. The Arun is joined by a number of streams flowing down from the north which rise around Rusper. Horsham has grown up around the Carfax. To the south of the Carfax is the Causeway. This street consists of houses erected in the 17th, 18th and early 19th century and is lined with ancient London Plane trees. The Horsham Museum is at the north end opposite to the recently developed former headquarters of the R.S.P.C.A.. At the south end of the Causeway is the Church of England parish church of St. Mary: Norman in origin, rebuilt in the 13th century and restored in 1864–65 by the Gothic revival architect S.S. Teulon. The area immediately to the south of the parish church is known as Normandy. It was formerly an area of artisans cottages and an ancient well. Fifty metres south is the River Arun. On the northern bank is Prewett's Mill and on the south side is the town's cricket field. A short walk along the banks of the Arun in a south easterly direction is Chesworth Farm, an area of open public access. To the north of the Carfax is a park, Horsham Park, the remnant of what was formerly the Hurst Park Estate. The park has football pitches, a wildlife pond and tennis courts. Leisure facilities, including a swimming complex and a gymnastic centre, have been built on land around the park. To the east along Brighton Road is Iron Bridge named after the railway bridge that carries the railway from London Victoria to Littlehampton. The area consists of mainly Victorian and Edwardian houses to the north of Brighton Road, whilst to the south there are areas of inter- and post-war housing. This area is known as the East Side. Horsham has developed beyond the original boundaries to incorporate some of the smaller hamlets which now form part of the outer districts. An area of Horsham named after a feeder stream of the River Arun. It consists of residential housing, the majority of which is of late 20th century origin. The suburb is substantial enough for two council wards. The hamlet around Old Holbrook House is immediately to the north of the A264 which abuts Holbrook. Holbrook House was previously the home of Sir William Vesey-Fitzgerald, Governor of Bombay and M.P. for Horsham (1852–1875). The Tithe Barn at Fivens Green is the most notable building in the district. This hamlet dates back to the late 18th century, when a small number of houses were in existence, with an inn opening in the early part of the 19th century. A station opened in the area in 1907, originally called Rusper Road Crossing halt, but later renamed Littlehaven. South-west of the town the Needles estate was laid out from c. 1955, with a mixture of privately owned and council-built houses and bungalows. Land around Hills Farm nearby was sold for development in 1972 and further development took place in the 1980s. The Needles are named after a local farmhouse, called so as it was built using timbers from ships wrecked on the Needles formation. In keeping with many other towns, new developments to the east of the town centre were rapid in the early Victorian era, and that area of town became known, as it is today, as New Town. The area contains the Iron Bridge, a steel structure that carries the railway to the south of Horsham. Originally used as a label to describe the northern part of the parish of Horsham (compared to Southwater to describe that part south of the River Arun), this area was developed as a district in the latter part of the 20th century. This area was originally known as Grub Street, and developed south of Depot Road in the 19th century. "Roffey" redirects here. For other uses, see Roffey (disambiguation). Roffey is north east of the centre of Horsham and as a hamlet dates back to at least the 13th century, with taxation records of 1296 showing 18 liable people in the area. Kelley's Post Office Directory for 1867 describes 'Roughey' as consisting 'of a few farmhouses and cottages. Here is an iron church, capable of accommodating 80 persons'. Maps of the 1880s show Roffey Corner (still spelt Roughey), but appear to label the hamlet as Star Row, with Roffey in use again by the start of the 20th century. A railway station opened as Roffey Road Halt in 1907, closing in 1937. The station is shown in the location now known as Wimland Road. Roffey is a separate ecclesiastical parish with its own parish church—All Saints' Church on Crawley Road, designed in 1878 by Arthur Blomfield. It replaced a temporary building which was licensed for worship in 1856. Roffey Park Institute is based just outside of Horsham, near Colgate. Tower Hill is a hamlet that lies one mile south from Horsham on a ridge of land containing a sandstone known as Horsham Stone rising above the town. A quarry existed here from 1830 to 1876. Tower Hill consists of housing dating from medieval to late 20th century. It has a public house called the Boar's Head, formerly the Fox and Hounds. The economic importance of quarrying Horsham Stone to Horsham in the 19th century has left a legacy of toponyms including Stone Pit Field, Stone Barn, Stonyhurst and Stone Pit Wood. An area of late 19th and early 20th centuries development on land west of the London Road at North Parade. It consists chiefly of semi-detached houses with corner shops, most of which have closed. Until the mid-20th century it was known as "The Common", after a piece of common land that survived enclosure in Trafalgar Road for many years. Trafalgar forms one of the wards of Horsham Hurst (electoral division) of the Horsham District Council. Horsham is a market town formerly trading in cattle, sheep and corn. Its prosperity was built on industries that included brewing, brickmaking, iron-smelting and printing. Although some of these survive, with the exception of iron smelting they are on a small scale and no longer employ large numbers of workers. In 2014 the important industries are financial services, pharmaceuticals and technology. Horsham is a commuter town serving London, Gatwick Airport and the South East Coast. RSA Insurance Group, an insurance company, has its registered office in Horsham. Sun Alliance merged with Royal Insurance in 1996 to form Royal & Sun Alliance Insurance Group, then renamed RSA Insurance Group in 2008. The company first came to the town in 1965 as Sun Alliance, becoming the town's biggest employer, at its peak it employed 2,500 people, plus the specialised computer centre called Lennox Wood, sited in Southwater country park to which many of the original Horsham computer department staff were relocated. At its peak, the company occupied several smaller premises on the Carfax, Springfield House near St John the Evangelist Roman Catholic Church, the building that is now a study centre in Hurst Road, Parkside and the whole of the St Mark's complex, and print and security centres in industrial estates sprinkled around Horsham, plus Tricourt House closer to the Carfax and now occupied by a housing association. Parkside has recently been partially occupied by West Sussex County Council after Royal Sun Alliance vacated the building. Until 2015 the Swiss-based multinational pharmaceutical company Novartis, formerly Ciba-Geigy before a 1996 merger, was a major employer in the town, but the plant is now closed and the site scheduled for redevelopment. The RSPCA, an animal welfare charity, has a £16 million headquarters at Southwater near Horsham, built to replace its former headquarters in the centre of the town. Located in the centre is also the Creative Assembly, which was founded in 1987 and is one of the UK's premier videogame developers. Horsham's town centre has many national chain stores, and although it has suffered the loss of some small and independent retailers, the town retains its reputation for individuality and attracts shoppers from a wide area. In 1992 the town centre was redesigned to greatly reduce the flow of traffic through the town's main shopping streets and West Street was pedestrianised by 1977. Much of the Carfax, which once consisted of two concentric rings of roads, was pedestrianised to create a new town square. The underground toilets that once served the Carfax are now underneath the war memorial. The bandstand was moved to its present site from the south corner of the Carfax. The Victorian drinking fountain now at the southern end of North Street originally stood on the Carfax. On the northwest side of the Carfax is Swan Walk, a shopping centre which opened in 1976 and was enclosed with a glass roof in 1989 with the addition of Springfield Court. Swan Walk takes its name from the Swan Inn that once stood where the pedestrian area now enters West Street, the old name being honoured by the bronze swan statues to the back of the mall and a mosaic in the centre. The shopping centre once enclosed the Capital Theatre which was built in the 1930s and was sandwiched between shops and a multi-storey car park from 1976 until its demolition in early 1983 when Marks & Spencer bought the site to build their store that opened in 1984. A further shopping area and public square, the Forum, opened in 2003 to the south of West Street. There is a partially covered shopping area known as Piries Place. East Street, formerly part of the main throughway through the town was pedestrianised in 2009..
Supermarkets serving the town include branches of Tesco, Sainsbury's, Marks & Spencer and Waitrose. In 2015, a new £8 million "Waitrose" and "John Lewis at Home" joint facility was opened after the closure of the smaller Waitrose that was formerly located in piries place. In the commercial centre of Horsham is an open pedestrianised square known as the Carfax. This area contains the Town's Memorial to the dead of the two world wars, a substantial, well used bandstand and is the venue for Saturday and Thursday markets. The name Carfax is likely of Norman origin – a corruption of 'Quatre Voies' (four ways) or 'Carrefour', a place where four roads meet. The Carfax was formerly known as "Scarfoulkes", the derivation of which is uncertain. Two other places in England share the name: the Carfax in Oxford and the Carfax in Winchester. The Rising Universe water sculpture in action. At the west end of the town centre formerly stood a kinetic water sculpture called the 'Rising Universe', colloquially known as 'The Shelley Fountain'. It was designed by Angela Conner, and erected to commemorate the poet Percy Bysshe Shelley who was born at Field Place in Broadbridge Heath, near Warnham, two miles west from Horsham centre. The fountain was designed to release a torrent of six and a half tons of water periodically, it was 45 ft across at its base, standing 28 ft high. It carried a plaque bearing one of his poems 'Mont Blanc'. The fountain was turned off in the spring of 2006 to save water. Despite recycling it used 180 gallons a day to cover evaporation and filtration losses. However, the council has made water saving efficiencies elsewhere and the fountain was turned on again on 13 November 2006, its tenth birthday but was turned off again after that Christmas. In May 2008 the fountain was turned off again due to the failure of its main hydraulic cylinder. On 19 January 2009 the fountain was fenced off for repairs. It was reopened without the fountain functioning. The fountain was again repaired at the start of March 2011 at a cost of more than £30,000 and was removed altogether in June 2016  with cost of upkeep being cited as the main reason. St. Mary's Parish Church and the River Arun in Horsham circa 1910. The Parish Church of St. Mary the Virgin is the oldest building in Horsham, having been in continuous use for nearly eight centuries. It is located at the end of the Causeway in Normandy, the oldest extant part of Horsham. It has a ring of ten bells. The earthworks of the eleventh century Horsham or Chennelsbrook Castle can be found near Chennells Brook. The Town Hall in the Market Square is a much adapted building originally dating from circa 1648 when it was referred to as a 'Market House'. In 1721 a new construction of Portland Stone was built containing a poultry and butter market. The building fell into disrepair and was substantially rebuilt around 1812. In 1888 it became the property of Horsham Urban District Council and was again largely rebuilt. The present building is essentially of late Victorian construction, though preserving some aspects of the earlier buildings. It has been used as council offices and as a magistrates court and more recently housed the Horsham Registry Office on the upper floor. The ground floor was still used as an occasional market place until the Town Hall was closed to be let as a restaurant. Horsham lies at the junction of three main routes with the dual carriageway A24 running north to south route from London and Dorking to Worthing. The A264 links Horsham to Crawley and the M23 to the east by modern dual carriageway and to the A29 to the west. The A281 runs between Guildford and Brighton. Bus services are provided by Metrobus, Stagecoach South, Arriva Southern Counties and Compass Travel. The railway station, Horsham, is on the Arun Valley Line from Chichester to Crawley, Gatwick and London Victoria. Trains on this line start from Bognor Regis or Portsmouth and Southampton Central, and are coupled at Horsham. Southbound trains divide here. Other services (stopping during the off-peak period) leave Horsham for London Bridge. Sutton & Mole Valley line services go north to Dorking, Epsom, Sutton and London Victoria. In 2012, work finished expanding and modernising the station. Littlehaven station (previously named Littlehaven Halt), in the north east of the town on the Crawley line, and Christ's Hospital station serving the west of Horsham. Horsham is 20 km (12 mi) from Gatwick Airport and 65 km (40 mi) from Heathrow Airport. Cyclists, pedestrians and horseriders can reach Guildford and Shoreham via the Downs Link, a long distance bridleway and cycle route which follows the now disused Horsham-Guildford, and Horsham-Shoreham railway lines and passes through Southwater, just to the south of Horsham. The West Sussex County Times is a paid newspaper that has served the town since 1869. The Horsham offices of the paper also publish a free newspaper called the Weekend Herald. Another free newspaper, The Resident, set up in 2008, was recently rebranded as The District Post. A free magazine, All About Horsham, is delivered to some properties in the district. College of Richard Collyer, (sixth form) founded in 1532, and known more commonly as "Collyer's", on Hurst Road. The Arun House adult education centre (a constituent institution of the Central Sussex College) is also on this road. Horsham Cricket Club play their home matches at Cricketfield Road which used to be used twice a season by Sussex CCC for matches. Although cricket was played in Horsham before 1768, the first recorded game of a town side was on 8 August 1771, which is when Horsham Cricket Club was created. The Club has played various locations over the years, before settling at the present ground in 1851. Horsham Cricket Club were national champions in 2005. Horsham F.C. is the town's senior football club and currently (2014–15) play in the Isthmian League South Division. They had some success a decade ago, reaching the final of the Sussex Senior Cup in 2007. They reached the 2nd round of the F A Cup in 07-08, losing in a replay to Swansea City. The team currently play at Culver Road in Lancing whilst they seek a new ground in Horsham. Horsham YMCA FC, founded in 1898, were playing their 2014/15 season in Division one of the Sussex County Football League . They are nicknamed 'The YMs', and play their home games at Gorings Mead in the Iron Bridge part of Horsham. Holbrook RUFC are a smaller rugby club, based at The Holbrook Club in north Horsham. It was formed in 1971 as Sunallon RFC, which was the name of the Sun Alliance Sports & Social Club. This developed into Sun Alliance RFC and following a merger with the Liverpool-based Royal Insurance in 1996, into Royal & Sun Alliance RFC (RSA). Holbrook RFC now have two teams as of the 2014 season, with the 1sts in Sussex League 1, and 2nds in Sussex League 3. Horsham Hockey Club who play their home matches at Broadbridge Heath Leisure Centre. Horsham Gymnastic Club have produced top female gymnasts a number of whom have progressed to the England and Great Britain national squads. In the weeks preceding the London 2012 Olympic Games, the Grenadian Olympic Team trained at Broadbridge Heath Leisure Centre, which is on the outskirts of the town. Horsham Community Hospital, is open weekdays, and is located on Hurst Road. The town has its own law courts, ambulance station, fire station and police station also located on Hurst Road. The Statutory emergency fire and rescue service is provided by the West Sussex Fire and Rescue Service. The territorial police force for Horsham and surrounding areas is Sussex Police. The Registry of births, deaths and marriages is located in Park House, North Street in central Horsham. Horsham Park immediately to the north of central Horsham is 24 hectares of open space for the use of the people of Horsham. It contains an 18th-century country house used in part by the Horsham District Council, formal gardens and a maze. At the eastern side is The Pavilions in the Park leisure centre with a gym and a 25m swimming pool run by a private company for Horsham District Council. A BMX and Skate park is located on the Hurst Road side of Horsham Park. The remaining space is used extensively for leisure pursuits such as tennis, football and rugby. Horsham Museum is located on the Causeway in a half-timbered medieval house. It has local history objects displayed in twenty-six galleries. Situated on North Street is The Capitol Theatre, Horsham, the venue (formerly Horsham Arts Centre) features a theatre, 2 cinema screens, a studio and gallery. On Lower Tanbridge Way is a two storey modernised library run by West Sussex County Council. The first illustrated history of Horsham was written in 1836 by Howard Dudley at the age of 16. It includes descriptions of St Mary's Church and other buildings along with lithographs and wood-cut images of the town. The book entitled The History and Antiquities of Horsham has been reproduced in full to enable research online. Sir Arthur Conan Doyle had the fictitious Openshaw family, in the Sherlock Holmes story The Five Orange Pips, residing in the town. Douglas Maddon's book The English Department's Whores, is a thinly-veiled satire of life in Horsham. John Roland Abbey (1894–1969), book collector. George Bax Holmes (1803–1887), palaeontologist. Robert Blatchford (1851–1943), author and socialist. Henry Burstow (1826–1916), singer and bell-ringer, important to the early twentieth-century folk-song revival, and for his 'Reminiscences of Horsham', published in 1911. Matthew Caffyn (1628 -1714), British General Baptist preacher and writer. Samuel Carpenter (1649–1714), First Treasurer and Deputy Governor of Pennsylvania. Born in 1649 in Horsham. His father was John Carpenter, the Sheriff of Horsham, who was murdered while attending his duties in Horsham on 9 August 1671. Edward Bainbridge Copnall (1903–1973), artist and president of the Royal Society of British Sculptors lived in Horsham from an early age. One of his works, a sculpture titled 'The Astronomer' was presented to the College of Richard Collyer in the town, by his sister Phyllis Millar and is on display in the upper quadrangle. Other examples of his work are kept by Horsham Museum. John Copnall (1928–2007), artist and teacher, a leading English abstract painter and teacher at the London Central School of Art and Design. Walter Crane (1845–1915) artist and book illustrator died at Horsham. Howard Dudley (1820–1864),wrote the first illustrated history of Horsham in 1836. Walter Dendy Sadler (1854–1923) artist and painter, was brought up in Horsham. Frederick Gough MC TD (1901–1977), an army major at the Battle of Arnhem, served as Horsham's Member of Parliament from 1951 to 1964. Catherine Howard (c.1520–1542), one of King Henry VIII's wives, lived in Horsham. Robert Henry Hurst (1817–1905). Liberal Member of Parliament for Horsham from 1865 to 1868, and from 1875 to 1876. Thomas Hutchinson (1698-1769) English clergyman and classical scholar. Hammond Innes (1913–1998), author, was born in Clarence Road. Chrystabel Leighton-Porter (1913–2000), model for the "Jane" cartoon during WWII. Bernard Lintott, (1675–1736), English publisher. Christopher Martin-Jenkins, cricket journalist and broadcaster. Thomas Medwin (1788–1869), poet and biographer of Lord Byron and his cousin Percy Bysshe Shelley. John Guille Millais (1865–1931), painter, naturalist and author, son of the Pre-Raphaelite painter John Everett Millais. Raoul Millais (1901–1999), artist, son of John Guille Millais. Edward Mote (1797–1874), Writer of the hymn 'My hope is built on nothing less' and was minister of Rehoboth Baptist Church in New Street for 26 years where he is buried. John Pilfold (1769–1834), Royal Navy officer most noted for his command of HMS Ajax at the Battle of Trafalgar. William Pollard (1828–1893), Quaker writer. Hugh James Rose (1795-1838), Theologian who becamePrincipal of King's College London,Vicar of St Mary's 1821-1827. Lt.-Col. George Styles GC (1928–2006), army bomb-disposal expert, was educated at Collyer's School. Eric Thompson (1929–1982), narrator of the British version of The Magic Roundabout, was educated at Collyer's School. William Vesey-Fitzgerald (1818–1885), Governor of Bombay, M.P. for Horsham who lived at Holbrook. Howard Vincent (1849–1908), Conservative Party Member of Parliament, barrister and police official who was born at Slinfold. Harry Enfield – English comedian attended Collyer's sixth form college. An emblem on the side of an Arriva bus celebrating Horsham's win of the Britain in Bloom contest. In October 2006, Horsham was pronounced the second best place to live in the UK, only beaten by Winchester. This was claimed by a Channel 4 show, The 10 best and worst places to live in the UK. there were two official homeless people living in Horsham. In 2007, a Reader's Digest poll put Horsham as the 25th best place in mainland Britain to bring up a family. On 27 September 2007, Horsham was awarded as the overall winner of Britain in Bloom in the large town / small city category a Gold Award. It also has the honour of being presented with the Royal Horticultural Society's 'Bloomin' Wild' award which reflected the theme for year's national judging. Horsham is placed number 27 in the book Crap Towns: The 50 Worst Places To Live In The UK. The satirical book describes Horsham as "a No Fun Zone run by new conservatives for old conservatives." Horsham has featured in the films 31 North 62 East and A Dark Reflection. ^ "Severe Storms". Metlink Teaching Weather and Climate. Archived from the original on 23 April 2013. ^ Landranger 187. Ordnance Survey. ISBN 0-319-22187-3. ^ "Murder investigation – Needles' bizarre past". Sussex Express. 26 March 2008. Retrieved 2 March 2010. ^ a b "Old map of Horsham area". Ordnance Survey / www.old-maps.co.uk. 1880. Archived from the original on 7 May 2009. Retrieved 17 April 2009. ^ Hughes, Annabelle (2000). A History of North Horsham Parish – to Celebrate the Millennium. Horsham: North Horsham Parish Council. p. 20. ^ "Business and Industrial". Horsham Official Guide. c. 1993. ^ "Results & Constituencies". BBC News. 2001. Archived from the original on 15 October 2012. Retrieved 20 April 2009. ^ a b c d "Horsham Town Guide". Burrows. Archived from the original on 28 May 2011. Retrieved 9 April 2009. ^ Stainer, Gina (23 June 2006). "Insurance firm to axe 1,000 job". West Sussex County Times. ^ "Homes and science park plan for Horsham Novartis site". Archived from the original on 23 January 2016. Retrieved 24 January 2016. ^ Penny, Thomas (24 July 2002). "RSPCA millions go on politics and HQ". The Daily Telegraph. London. Archived from the original on 27 September 2009. Retrieved 20 April 2009. ^ County Guide West Sussex. Philips. ISBN 0-540-01267-X. ^ Moyes, Jojo (27 January 1997). "Hail to thee, blithe spirit (But not if you live in Middle England)". The Independent. London. Archived from the original on 16 March 2011. Retrieved 7 September 2009. ^ Christie-Miller, Alex (12 June 2008). "Broken fountain will rise again". West Sussex County Times. Retrieved 20 April 2009. ^ "Repairs to Horsham fountain". West Sussex County Times. 9 January 2009. Retrieved 20 April 2009. ^ "Shelley's fountain to be repaired". BBC News. 18 February 2010. ^ "Dismantling Shelley Fountain". West Sussex County Times. Archived from the original on 17 June 2016. Retrieved 22 June 2016. ^ "Horsham's 'costly' Shelley fountain to be dismantled". BBC. Archived from the original on 6 May 2016. Retrieved 22 June 2016. ^ Historic England. "Motte and Bailey Castle North of Chennells Brook Farm (1014389)". National Heritage List for England. Retrieved 11 June 2017. ^ "Chennells Brook Castle". Flickr. Archived from the original on 25 October 2016. ^ "Expired website - This website has expired". hiddenhorsham.co.uk. Archived from the original on 7 November 2012. ^ "Slideshow: inside Horsham Railway Station". wscountytimes.co.uk. Archived from the original on 3 June 2013. ^ "Holbrook Rugby Football Club". Archived from the original on 9 November 2004. ^ "Horsham Hockey Club". pitchero.com. Archived from the original on 11 April 2013. ^ "Neighbourhood policing". Sussex police. Archived from the original on 29 December 2007. Retrieved 3 December 2009. ^ "Pavilions in the Park". D C Leisure Management Ltd. Archived from the original on 26 September 2010. Retrieved 20 April 2009. ^ "Horsham District Skate Park". Horsham District Council. Archived from the original on 13 July 2009. Retrieved 20 April 2009. ^ "Welcome to Horsham Museum". Horsham Museum. Archived from the original on 27 June 2009. Retrieved 20 April 2009. ^ "The Capitol, Horsham". Horsham District Council. Archived from the original on 26 April 2009. Retrieved 20 April 2009. ^ "HORSHAM LIBRARY". Horsham District Council. Archived from the original on 28 August 2008. Retrieved 20 April 2009. ^ "Oxford DNB article:Abbey, John Roland". Retrieved 15 October 2008. ^ "Christabel Leighton-Porter". The Daily Telegraph. Archived from the original on 19 December 2015. Retrieved 13 December 2015. ^ McLaverty, James. "Lintot, 'Barnaby' Bernard". In Matthew, H.C.G. and Brian Harrison, eds. The Oxford Dictionary of National Biography. vol. 33, 947–948. London: Oxford University Press. ^ Pollard, William (1828–1893), Charlotte Fell-Smith, rev. K. D. Reynolds, Oxford Dictionary of National Biography, Oxford University Press, 2004. ^ "Rose, Hugh James (RS812HJ)". A Cambridge Alumni Database. University of Cambridge. ^ "Eric Thompson Biography (1929-1982)". filmreference.com. Archived from the original on 6 October 2014. ^ "Debrett's House of Commons". archive.org. ^ a b "Horsham District Twinning Association". Horsham District Council. Archived from the original on 21 April 2007. Retrieved 13 June 2007. Wikimedia Commons has media related to Horsham. Wikivoyage has a travel guide for Horsham. Chisholm, Hugh, ed. (1911). "Horsham" . Encyclopædia Britannica (11th ed.). Cambridge University Press. This page was last edited on 22 April 2019, at 04:04 (UTC).